When Rich and Sue decided to retire to the California Coast they did it in style. 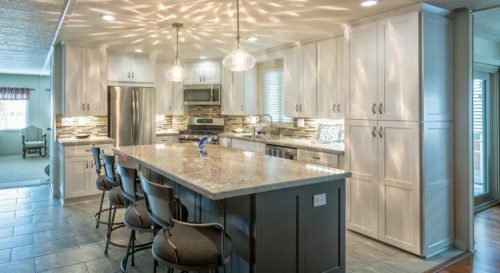 Their modern manufactured home kitchen remodel is gorgeous! Originally from Iowa, the couple dreamed of warm sandy beaches on the California Coast. Unfortunately, the housing prices in California can put the brakes on many people’s dream. Rich and Sue did what millions of people are doing all across the country, they opted for a lower-priced manufactured home in sunny San Marcos. Choosing a manufactured home at half the cost per square foot of a site-built home allowed the couple an opportunity to create a retirement home of their dreams. 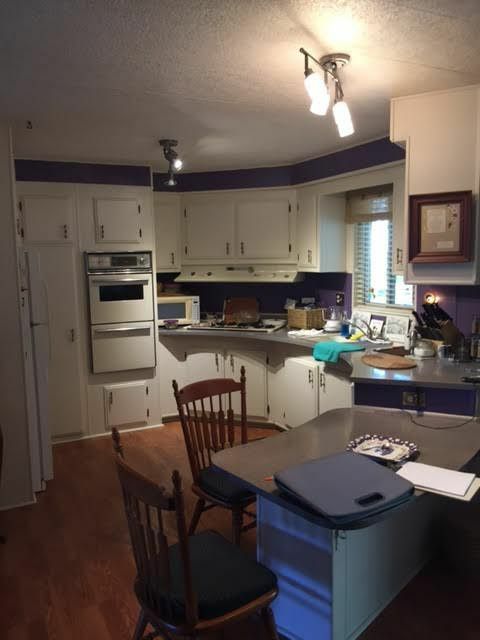 The kitchen in Rich and Sue’s California manufactured home had bright purple walls, original cabinets, and a circular layout so they brought Home Remodeling Center aboard to design and implement their modern manufactured home kitchen remodel. The kitchen before the modern manufactured home remodel. Oftentimes, it’s more cost efficient to hire a designer to help plan a new kitchen. Experience and contractor connections can reduce remodeling issues and make the process easier for homeowners in a new town. 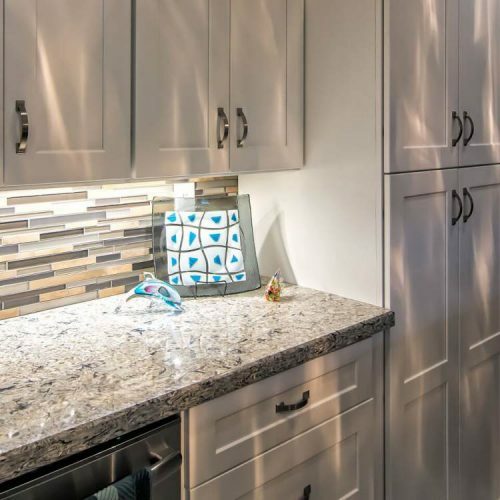 Larger remodeling contractors often have professional designers on staff to help homeowners design their dream kitchens because it reduces homeowner stress and makes the process easier for the contractors, too. While we are huge fans of DIY mobile home remodeling, we realize that hiring experts can make a project easier and less stressful, especially for people that are moving to a whole new state. Kitchen remodels are especially tricky as no one wants to deal without a functioning kitchen for long. Having an open and airy kitchen was important for the couple. The first things to go during demolition were a half wall that separated the kitchen from the living room and an oddly shaped peninsula that boxed in the kitchen. With the half-wall removed they could install a large island. The rich gray island has ample room for prep work in and an overhang large enough for four bar stools. It is topped with a quartz with some enticing movement to create a great focal point for the space. The perimeter cabinets are white to keep the kitchen light and bright. 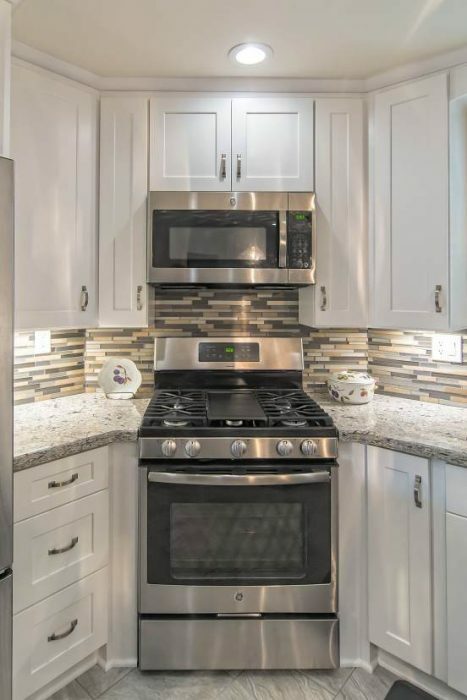 The glass and stone backsplash blends the gray and white cabinets with the quartz. 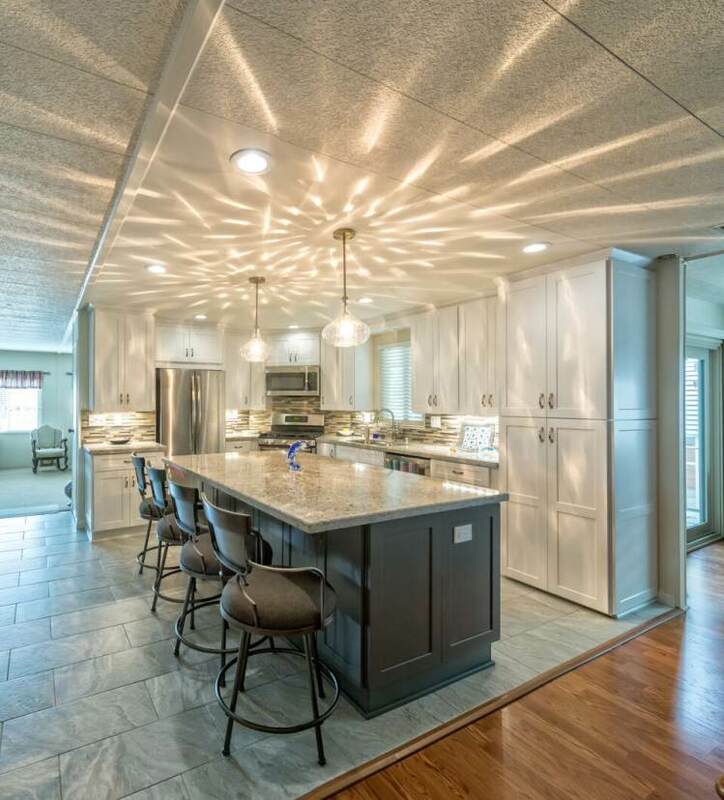 The gorgeous pendants cast an unexpected light show on the ceiling. The various gray tones are gorgeous! Gray is a versatile color for walls, ceilings, floors, and cabinetry. It can both lighten a room and darken a room depending on what tone you choose. Barbara Preston, the professional designer of this modern manufactured home kitchen remodel was kind enough to share this project and answer a few questions for us. Any tips or tricks you can offer homeowners during large remodels? Stay calm! Biggest challenge: This was a very smooth remodel. The selection of products went smoothly and the installation sailed along right on schedule. Hope you enjoyed this great manufactured home remodel! Check out a beautiful modern mountain chic single wide here! We weren’t paid to share this awesome modern manufactured home kitchen remodel or to mention the company. Barbara Preston, the proud designer, was simply kind enough to contact us about the project and we loved it. Of course, we wanted to share it with our readers! Contractors and other professionals are more than welcome to share their projects with us – the more manufactured home inspiration we can share the better! We have a long way to go to catch up to all the great inspiration and ideas that site-built homes have available online. As always, thank you for reading Mobile and Manufactured Home Living (Mobile Home Living, for short). We appreciate your support! Totally in love with those pendants! Where can they be found? Whenever you want to remodel your kitchen, you must have to prepare a detailed list, which includes the design, new appliances and items, etc. and that too within a specific budget. Then, you will look for a good home remodel contractor. When the professionals would ask you about your requirement, you have to clear everything that exists in your mind. You can also ask them for suggestion as they are experienced and have innovative ideas. You have to take forward the work in such a way that your primary objective of the improvement would be met. Great tips Linda! You are right about clearing your mind, you have to be open to all the options! 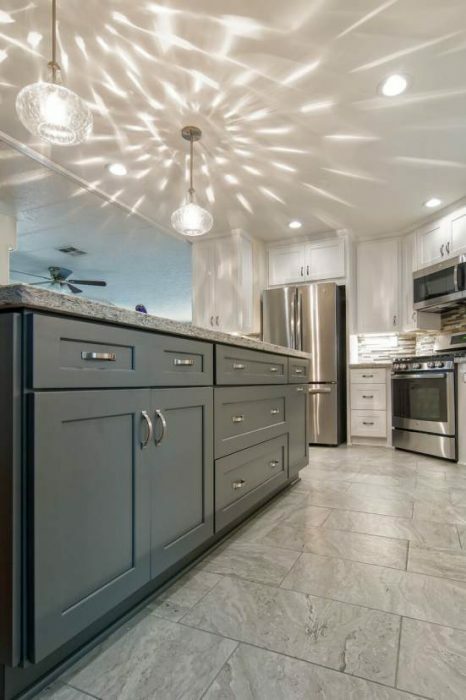 This kitchen looks beautiful. Nice post. I must say I love DIY projects, especially if you have the time and patience for it, but I do agree with you. Hiring experts is way less stressful and much easier. Love the post!